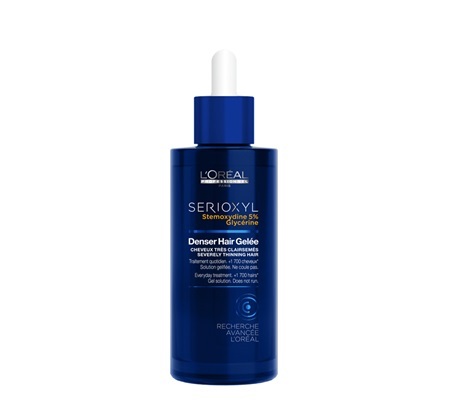 L’Oréal Professionnel Serioxyl Denser Hair Gelée, 90ml is an innovative daily densifying serum-gel for thinning hair. This super serum provides a 3 month daily programme for denser looking hair. An everyday solution to achieve denser looking hair. A molecule born of ten years’ research. Known for its hydration properties. Apply 4 pipettes to the scalp in the evening for 3 months to dry or towel-dried scalp. Massage with fingertips until absorbed. Do not rinse. Leave to dry. Buy Serioxyl Denser Hair Gelée 90ml on-line today at Riah Hair.